AudioConnect is a 2-in, 2-out audio interface specifically designed for audio testing. AudioConnectTM is a 2-in, 2-out audio interface specifically designed for audio test and measurement. It offers analog audio in and out with a 44.1kHz sampling rate, USB control, and a power indicator; all other typical audio interface controls that are not used for audio test applications have been eliminated. This makes operation and calibration simple with no room for error. 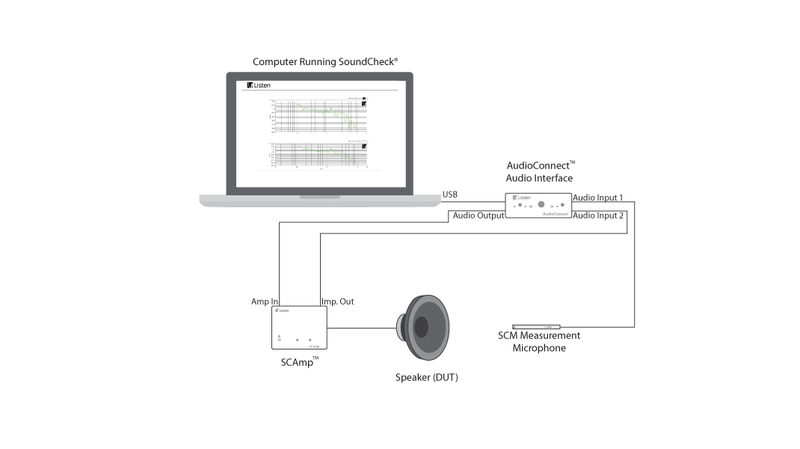 AudioConnect is packed with additional features to simplify your audio test set up, including power for Listen’s SCM microphones with 0dB/20dB gain, and a headphone amplifier. An integral USB hub offers a logical place to keep the SoundCheck hardware key. AudioConnect is supplied fully calibrated.